This season may come down to the Jimmie and Kevin show, but it sure has been interesting to see how long is has taken some drivers to get adjusted to this new rules package with less horsepower and downforce. And then there are the drivers who haven't gotten a handle on it yet. If you have been following this column, you know that I am not placing much emphasis on last year's statistics. In fact, when doing final picks I weigh 2013 much more heavily. The Likely Suspects: This two-miler has been a very good track for these drivers: Kevin Harvick, Tony Stewart, Clint Bowyer, Greg Biffle, Jimmie Johnson, Dale Earnhardt Jr. and Paul Menard. My 2 Cents: My no-brainer pick this week is Kevin Harvick. My next picks are Matt Kenneth, Tony Stewart, Clint Bowyer, Greg Biffle and Paul Menard. I will complete my team with (gulp) Ryan Blaney and Danica Patrick. Starting position is crucial this week, so pay careful attention to the starting lineup when doing your final picks. Think top 10! My final four: Kevin Harvick, Greg Biffle, Paul Menard and Danica Patrick. 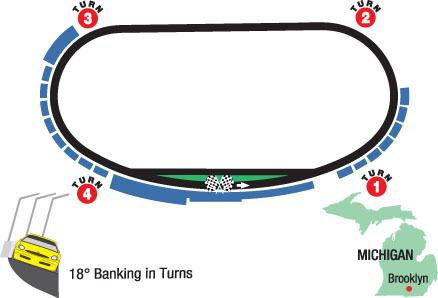 The Coors Light pole position is the most proficient starting position in the field, producing more winners (18) than any other starting position at Michigan International Speedway. 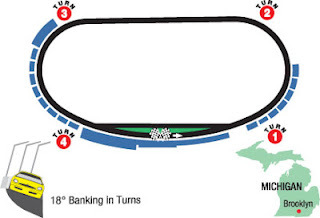 Of the 91 NASCAR Sprint Cup Series races at Michigan, 26 (28.5%) have been won from the front row: 18 from the pole and eight from second place. Three-quarters of the Sprint Cup races at Michigan (69 of 91) have been won from a top-10 starting position. Carl Edwards leads all active drivers in the NASCAR Sprint Cup Series in average finishing position at Michigan with a 9.714. Jeff Gordon leads the series in runner-up finishes at Michigan with eight, followed by Darrell Waltrip with seven and Kevin Harvick with five.